The third edition of Public Health: A Compact Introduction to Social and Preventive Medicine (otherwise known as Public Health Kompakt) is available as an eBook beginning in December 2017. The 525-page German-language textbook provides basic information about public health, including prevention, health promotion, epidemiology, biostatistics, and healthcare systems. The book is directed toward students of medicine, public health and nursing, as well as population scientists, health economists, and other healthcare professionals. In addition to defining basic terms and concepts, the German-language textbook provides relevant basic knowledge in the fields of prevention, health promotion, epidemiology and biostatistics. The new edition has been updated and expanded to address issues such as the global approach to public health; migration and refugees; work and health; the aging of the population; and the “Life Course Approach to Health”. Commissioning Editors for the book were Matthias Egger of the University of Bern’s Institute of Social and Preventive Medicine, Oliver Razum of the University of Bielefeld (Germany), and Anita Rieder of the Center for Public Health at the Medical University of Vienna. It was a “great collaboration between colleagues in Austria, Germany and Switzerland,” says Egger. The book is available online from Berlin-based publisher De Gruyter (www.degruyter.com). A campus-wide eBook license costs 400 Euros and the paperback sells for €39.95. 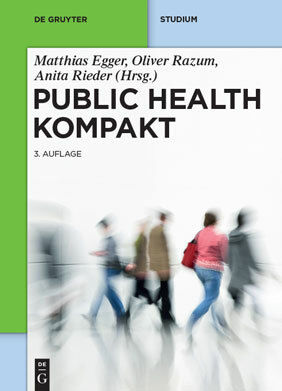 For the online version of Public Health kompakt in German click here.